Attendants: 1 can be you or us, must be us at a school or public event. 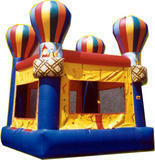 This inspiring Adventure Jump hot air balloon bouncer is 15'4" x 14'4" and will uplift everyone at your party! The Adventure Jump House rents for $285.00 per day. This Air Castle can accommodate from 8-10 small children at a time, with a 450 lb. limit. Suitable for children 12 years and under, minimum height 30”. Unit is not acceptable for adult use. You must have a flat area, 17´ x 16´ big for this castle. This Adventure themed Air Castle fits many themes and is bright and colorful.